Read on for the full story on this “Spunky Madam” (to quote someone I know) with a penchant for quality roast ‘halal’ ducks, and making an impact in a stranger’s life ….. Articles plastered all over the walls. Squint and you might just find my post on the extreme right. How ironic that Madam Heng herself is a Hainanese like yours truly. And the irony does not end there. Decades ago (almost wanted to put centuries), my late grandfather used to work in this same shop. Yes, read that right. He was selling (you guessed it!) Hainanese chicken rice, before moving over to Ipoh Garden area and started working for the legendary “Wong Gung Gai Fan” (“Kingdom?” chicken rice shop). You see, aside from the famous Pak Gong (still darn popular now, situated on Theatre Street next to Rasa Sayang Chicken Rice), Wong Gung was the other much sought after brand. I believe, the old-timers of Ipoh would have attested to this fact. 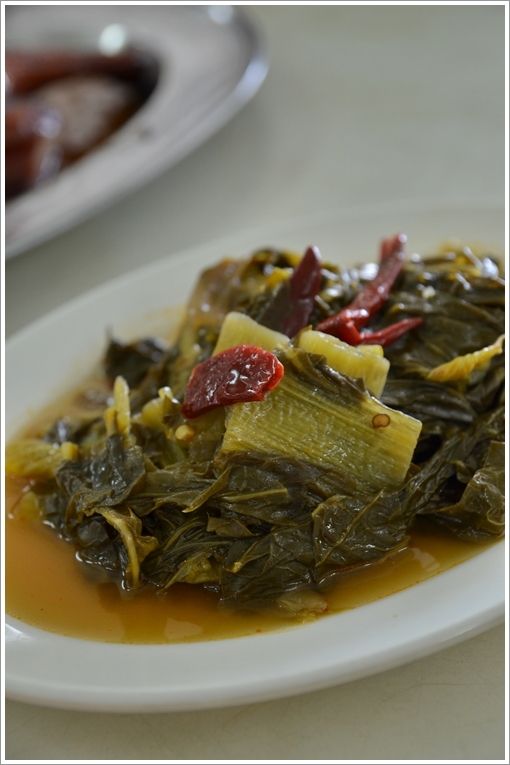 Like an Asian-ized version of the sauerkraut, this spicy and sour vegetable dish (“Gai choy” or “Choy Geok”) complements any protein-laden feast perfectly; balancing the heaviness with a tarty finish. And the connection does not end there. Madam Heng told the story from her perspective, on how their family started Wong Gung (the one in town, as the Ipoh Garden’s branch is operated by the nephew or someone else) back then. ‘Twas indeed a small circle seeing how the Hainanese clan from the pre-colonial days; bracing through war and the Independence era, leaving a small fragment of memories intact in their delicious rendition of Hainanese chicken rice up to this very day. And I am but one of the many descendants still craving for an award-winning plate (or at least, Lonely Planet-worthy?) of chicken rice. Generally the ducks here are less fatty than the usual roast ducks, with a crispier skin, tender and non-gamey meat, served on her signature sauce that’s less overpowering than most ‘hoi sin’ sauce or plum sauce. Fast forward half a century or so, and here we are seated on the same table; connecting the dots. 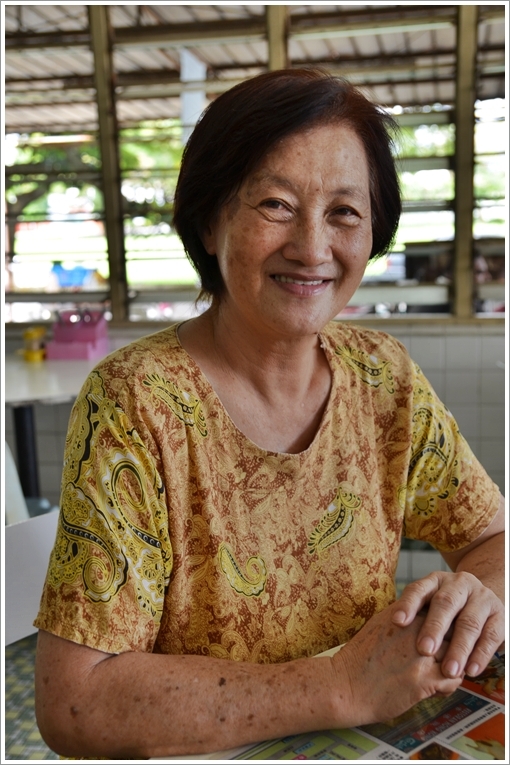 Madam Heng’s prides on her roast ducks with a marinade from a combination of herbs that render colourant redundant. Usually, before roasting a duck, to brown the skin to an aesthetically-pleasing outlook, the cook will glaze the skin with a mixture of maltose/honey plus red food colouring agent. But she believes that there has to be a way to do without the artificial colour, and succeeded in her endeavour. There was this photograph where she showed me the pre-roasted duck; the skin appearing to be a lacklustre beige/white and I daresay, almost of unpalatable sight. But miraculously, after the duck has gone through the roasting process, the skin browned to a beautiful mahogany shade. Another plus point? She believes that the ducks do not have to be of excessive fattiness, thus removing almost all of the unpleasant fats from under the skin. This was something new to me, as I believe ‘halal’ roast ducks do not come by that easily here in Ipoh, or maybe Malaysia? Her stall is a favourite with people from all walks of life, even the Muslims. The ducks are sourced from a Halal slaughterhouse, and the shop sells only pork-free foods. She showed me a picture of herself on the same table with the former Transport Minister, Dato Sri Ong Tee Keat. Seemingly, he’s a fan of her roast ducks too. Homemade kaya (egg and coconut jam) available at the counter. “This is Hainanese style of pure, homemade kaya”, claimed herself. And we got one container of this, yet I wonder if that’s already finished by now in Ipoh. There’s a whole chunk of the conversation missing from this epilogue. This brain might have been battered from the excessive routine as of late. Even at this time of writing, I am preparing for a 3 days excursion to Kota Kinabalu of Sabah yet this time it’s for work, and there’s no time for ample preparation for a food hunt or any of the sorts. Would be appreciative if there’s any of you volunteering to throw Motormouth here some MUST-EAT’s or MUST-SEE’s in Sabah. Still her affable, charming self. Madam Heng seeks growing opportunities in the Klang Valley. Here’s a community service I am not prone to do; but heck, why not? 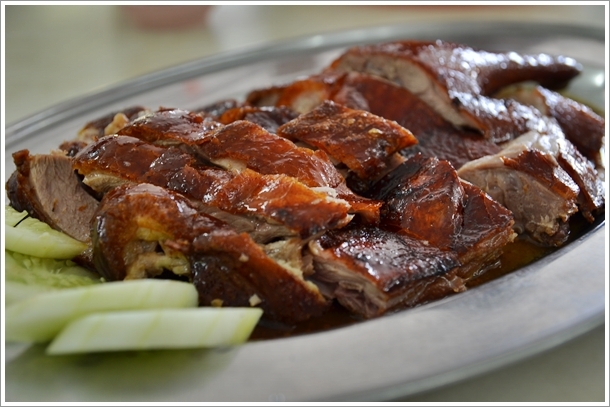 Madam Heng is considering to spread this amazing legacy of Hainanese roast ducks to the Klang Valley. Thus, if there’s any of you readers who’s game for a challenge, or know of any like-minded person who would jump at such business venture, please drop her a line. Or if you’re shy, contact me instead and I shall pass on your interest to her. *Jump to the original post on this stall for more details. I love all these places which have a history of serving great food! You always tell a great story j2kfm! well done.. i want some Hainanese duck! You’re flattering me lah ….. let’s do some roast ducks, or geese someday. Pudu? I think she will do really well in KL especially since she does Halal ducks. The portrait of the owner is nicely taken! I love roasted duck as well… Very interesting to know that this is Halal! The ducks are from halal source. Though the shop is pork free, but without certification. You can find Muslims dining there though, a rare sight since the olden days. Haha … didn’t know you go dot com already pun! Until I searched. Yeah do inform her bout this story, since I did not tell her that the shot’s gonna be put online. 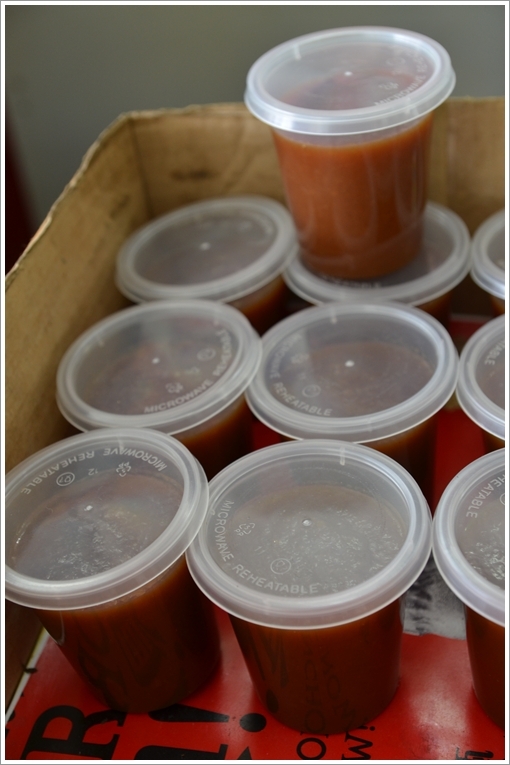 i can see the crispiness of the skin from ur photo, can’t wait for the their arrive at Klang Valley. Let’s hope she can find someone of interest to start this business in Klang Valley. I have tried this before. It is not too bad, in my opinion, but I still prefer Yeong Wai’s duck 🙂 Thanks for the review !! Looking forward to more exciting posts from you. Thanks Weng. Sun yeong Wai’s ducks are okay, but on days the ducks can be really gamey, tough and not crispy. Been some time since my last visit though, and I only like the Ampang’s branch. Didn’t know about this stall until now, kudos to her! 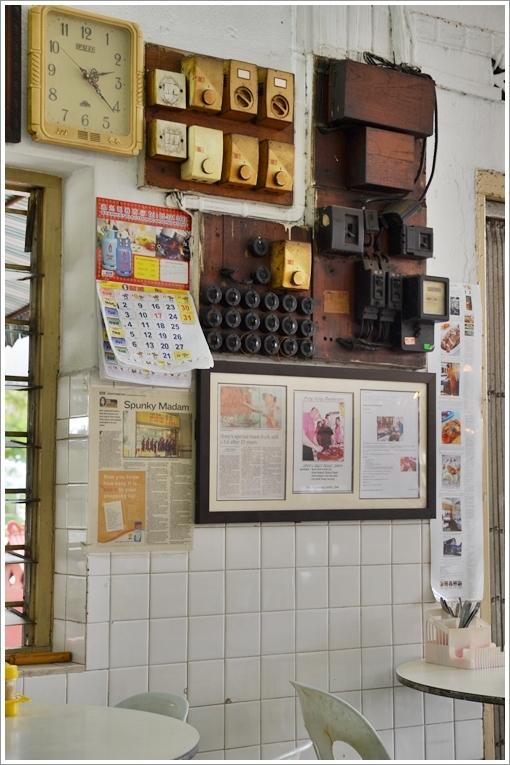 Was introduced to your blog recently and I love reading about your Ipoh food stories. My husband used to live in Canning Garden and I (a KL girl) have been to Ipoh a few times. My husband also told me stories about the popiah old man and I have eaten at this corner roast duck shop. However, I am not such a fan of the duck and its pricing. However, the concept of reheating with hot oil is quite good since it makes the cold duck nice and warm again (since the turnover is quite slow). My fav duck shop is called Sunrise located in Sea Park, PJ. The ducks are hot and fresh and juicy. However, b4 u go, take note of the big lunch crowd and the hot, hot shop environment. Price-wise, I would not say that this is the cheapest around, but still, considering the other options around, I would say this is definitely my favourite. My dad’s, too. I have tried Sunrise before, and had to be there by 12pm else risk waiting around for ages. Not bad indeed, but shop too small and stuffy to be considered on a frequent basis. Oh, this is the place uh?!! Everytime when I drove passed, I see a lot of people lining up. Yeah, in fact there are two more coffee shops that serve pork free food in Canning Garden. Wow I remembered this roast duck. Tried it before some time back. It was awesome. Skin is crispy to perfection. I would say my favourite would be the black sauce for dipping the crispy duck in before putting it into ur mouth. Awesome. And of course the ”chap choy” makes me feel totally at home. Yummmmy…. 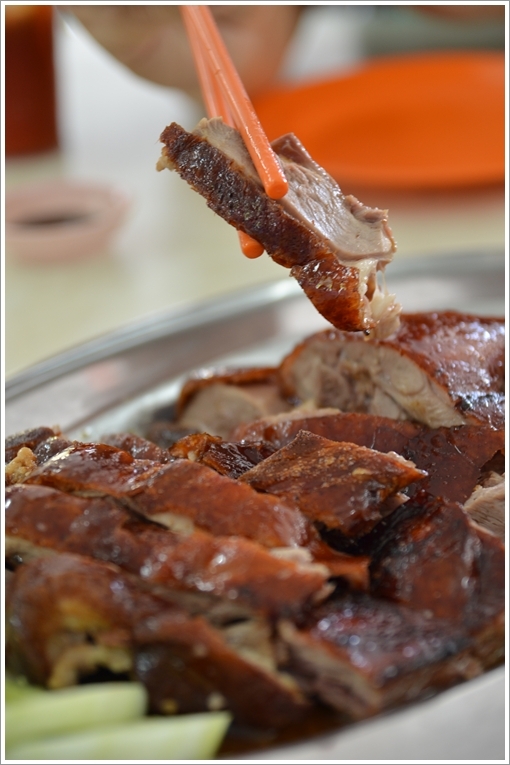 I tried most of the roast duck restaurants in Ipoh & I can say this is the best among all! 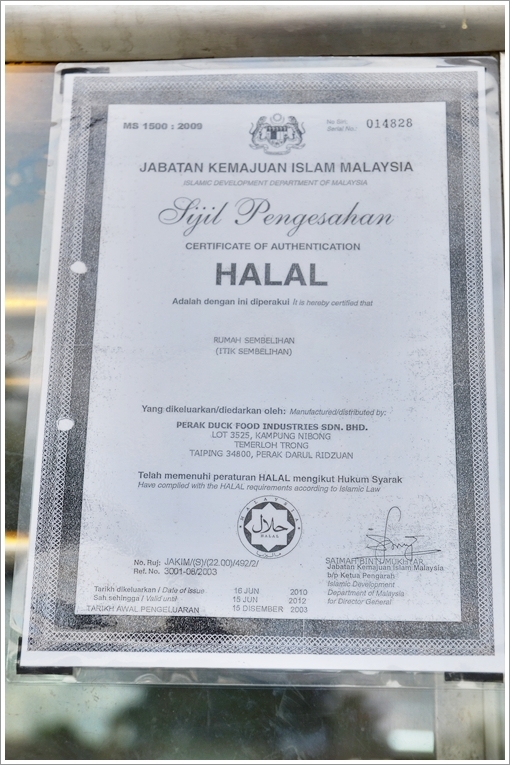 I only got to know this restaurant is Halal after viewing your website & recommendation. Hi Abdullah. Glad that you enjoyed the roast duck there. Many would not have known that this shop serves halal roast ducks, and other pork-free fares as from the outside, the place looks like any other coffee shop. It is with a heavy heart to say that the lady just informed me that she is selling of this business in the second half of 2011. Been a customer there for more than 15 years! Yeah, maybe she has decided to move on and enjoy life instead? Should be grateful that you have enjoyed what she had to offer; good roast ducks with a heart.